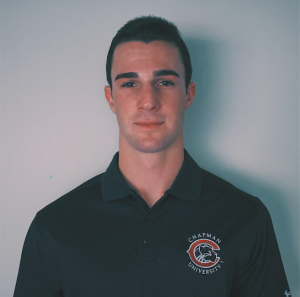 We at SportsForce would like to congratulate Joel Brown on his commitment to Chapman University! Here are Joel’s recruiting story and interview after his commitment. Good luck as a Panther! I wasn’t up to speed with the recruiting process until the middle of my junior year. My dream has always been to play baseball at the collegiate level and to stand out on teams I play on. When I started playing with Trosky Baseball in the summer entering my senior year I began to realize how behind I was in the recruiting process when I realized the majority of my teammates were committed already. The reality of my current position in the recruiting process didn’t come easily to me because I had the mentality that I had to go to a D1 school. With the advice and knowledge passed on from Coach Ryan Thompson, I was able to sign on with SportsForce and dive into the recruiting process head on. We did research and selected at least fifty different schools that fit my interests. After my first email campaign, I was amazed at how many schools/coaches were interested in me and how many positive responses I received. I followed the instructions I received from SportsForce and created dialogues with numerous coaches. Eventually, I was able to showcase my skills in front of many of these coaches at tournaments and showcases. After the first month or two, I received my first offer and soon after I received 3 more. None of these schools were D1 colleges, but it didn’t seem to matter anymore. I realized the most important thing was a good education followed by a great degree. I found a school with a perfect social fit, location and baseball program. I am confident that I will be able to stand out and be an impact player in their program. I am thrilled that I committed before my senior season started because it is extremely stressful not knowing where you are going after your senior year. I am now able to completely focus on my last year of high school baseball and just have fun. I will be attending Chapman University. I chose Chapman because of a handful of reasons. I like that it is a medium size student body so I won’t have to walk around campus and see the same faces every day. It is located an hour away from where I live in Southern California so my family and friends can come watch me play whenever they want, and it’s a ten-minute drive to the beach. Chapman offers a fantastic education and a variety of different degrees. The baseball program is a top D3 program where I know I will be able to excel and be coached by experienced coaches who know how to coach a championship team. SportsForce started off helping me by giving me the truth to the reality of recruiting. We then identified schools that would be the right fit for me academically and athletically. SportsForce did an amazing job at helping me create custom emails to send to coaches. SportsForce has a great staff that includes guys who were pro athletes and collegiate coaches so they know what specifically should and shouldn’t be said in an email. SportsForce also really helped in the dialogue process with coaches. When I didn’t know how to reply to a coach, I was always able to ask for help and I would always receive an immediate response. I would say to start off with a quality highlight video that includes batting and your position. Create dialogues with coaches as early as your sophomore and even freshman year because it is never too early to start. Don’t be afraid to call coaches and ask them where you currently stand with them in their recruiting process and how you can proceed with them. Understand the realities of recruiting and keep an open mind to any division of a school because you may fit a lot better in a school you may never think you would go to. Go somewhere where you know you can play and not sit on the bench for 2 or 3 years. I couldn’t be more excited to go to Chapman. The reality of my commitment hasn’t even set in yet. It still feels unreal. I couldn’t be happier with my decision to commit there. I found a college where I will be happy for the next 4 years. D3 schools don’t offer athletic scholarships, but I received a 40,000 dollar grant and the coach is helping me find other ways I can save money. On top of the 40,000, I expect to save double that. I would recommend SportsForce to any other athlete because recruiting today is entirely different than it was 10 years ago. You can’t just be a star athlete on your high school team or have a good weekend at a tournament and receive a college scholarship. You have to go out of your way and contact as many schools as possible and SportsForce makes sure you are able to successfully do this. They helped me receive opportunities I wouldn’t have been able to receive on my own. SportsForce is the way to go if you are serious about playing college athletics. If your high school son or daughter is seriously interested in playing their sport in college, then they have already begun climbing the college recruiting mountain. this means they are NOT being “actively” recruited by college coaches. It also means they are at the base of the recruiting mountain and may have a considerable journey ahead of them to reach the top and secure a roster spot or scholarship offer. One of the keys to successfully climbing the college recruiting mountain and securing multiple offers is to begin developing meaningful and ongoing relationships with college coaches. “We have heard great things about you. I wanted to let you know that we are very interested in building a relationship with you and your family. I would love to get on the phone with you today or tomorrow. Please pass this message along to your parents/guardians, as I would love to speak with them as well. Let me know a good time to call. The SportsForce client that was the recipient of this email has scheduled a college visit and has begun building a strong relationship with this coach and staff. Although it may take some additional time to ensure there is a mutual fit between this coach and our student-athlete, they are clearly off to a great start on their journey to the top of the college recruiting mountain. College Recruiting has changed…Your Approach may be Outdated! 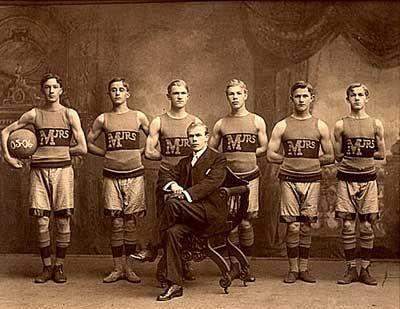 In the 1990’s, the surge of competitive youth sports and club teams exploded in the United States. Since that time, joining a competitive club team and attending showcase tournaments or camps have become the dominant choice of more serious middle school and high school student-athletes. The driving motivation is typically to improve their skill sets, compete year round and ultimately enhance their college recruiting opportunities. Freshman Year: The student-athlete has a high level of passion and desire to excel in their chosen sport. They commit to spending additional hours on personal training and skill work, or hire a sport specific specialist to help. At this point, they have most likely already joined a club or travel team to compete outside of the high school season and are often attending numerous tournaments, camps, combines or showcases annually. As the year progresses, the student-athlete goes on to play for their high school team. The hope is that their improved skills and abilities catch the eyes of college coaches in attendance at one of their competitive events. The tragedy taking place today, is that most student-athletes and families are still following this outdated 1990’s approach to college recruiting, or what we call the “hope” strategy. Why can this recruiting approach be so limiting and usually ineffective for the more than 8 million high school student-athletes in the U.S.? The importance of joining a competitive club team or playing in appropriate tournaments is not in question here. They can greatly help to advance your son or daughter’s skills in the off-season, or possibly assist in being evaluated by a college coach at a large showcase event. The club team coach may even know a few college coaches they can call on behalf of your son or daughter to provide additional feedback. However, the approach families take to college recruiting is being challenged in three key areas. 1.) First, most club teams simply do not possess all of the necessary tools, time or resources needed to personally mentor and guide each of its players over a two, three or even four year period, let alone helping them to secure and manage multiple offers. 2.) Second, the majority of parents do not understand how to effectively promote their son or daughter to right-fit college coaches and programs. 3.) Last, families are spending thousands and thousands of dollars each year to attend multiple ID camps, tournaments, showcases, or combines in the hopes of generating interest or “looks” from college coaches for their son or daughter with too often, little or no results. Unfortunately, most parents don’t fully understand how coaches evaluate and recruit at these events. There are normally several hundred, or maybe over a thousand players in attendance at a showcase tournament and college coaches do not have the ability to scout every player. John Wooden, former UCLA basketball coach and the creator of the Pyramid of Success is a huge inspiration to many coaches, players and parents across the world. Thinking about the college planning and recruiting process, it struck me to create a “Pyramid of College Recruiting Success” diagram. The purpose is to help make crystal clear what the different stages of the climb up the pyramid are, and the keys to its success. 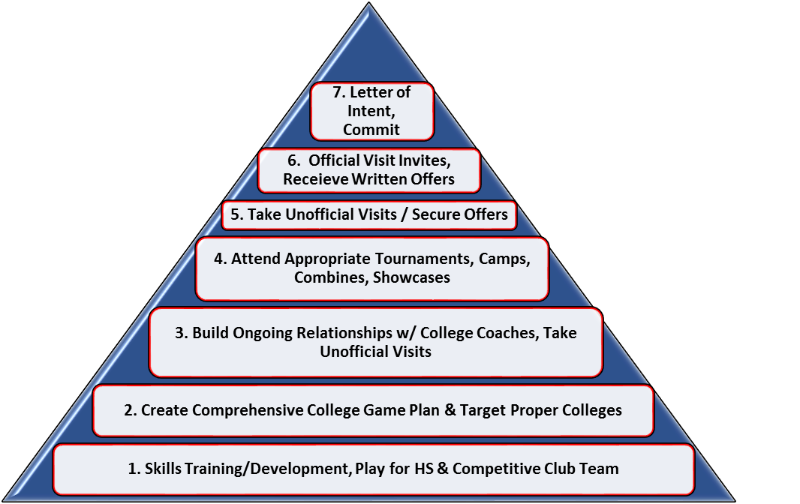 This pyramid presents families and their student-athletes with the opportunity to begin taking more control over their college recruiting options and choices. The biggest difference between this approach and the one started in the 1990’s is the importance of creating a comprehensive college recruiting game plan. It should include specific goals and strategies that may ultimately help to generate multiple offers from best-fit schools. The initial target list schools should at least match your son or daughter’s athletic skills, academic abilities, potential playing time opportunities, academic goals/majors, school location/size, and financial budget (note: most scholarships are not full-rides). The other major focus point is centered on the importance of the student-athlete taking the time to begin building and sustaining relationships with college coaches as early as possible. A student-athlete should be developing an ongoing and “personal” dialogue with 10-12 college coaches, or maybe more. As college coaches and student-athletes advance through the recruiting process together, it is only natural that some coaches will be more interested in certain players over others. The opposite also takes place as student-athletes begin to narrow their choices of schools/sports programs that best fits their needs. Too often, student-athletes make the fatal mistake of placing all of their recruiting focus and energy on one or two colleges, only to be left out entirely when offers are made because the coach recruited and offered a roster spot or scholarship to a different player. One of the least efficient and most costly ways to being recruited is by attending all of the tournaments, camps and showcase events you hear about. That can be a very expensive and time consuming endeavor for your entire family. The goal, rather is to pinpoint those competitive events where your potential best-fit college coaches will be in attendance and to build a relationship with them prior to the event. Again it’s important to outline what a best-fit school and sports program looks like for your son or daughter. As previously mentioned above, these priorities should include things like: athletic and academic abilities, potential playing time, opportunity to turn professional in their sport (if desired or realistic), available majors, future career networking opportunities, location, size and potential financial obligations or savings. It’s very important to ask yourself what your family’s college recruiting game plan is, and if it is clearly defined. Everything starts with an honest evaluation with where you and your child are in the process. If done properly, this new approach could exponentially increase your son or daughter’s chances of being recruited and may ultimately help in securing multiple offers from their best-fit schools. SportsForce is a College Recruiting Advisory Group based in San Diego, CA. Our entire team of college recruiting advisors dedicate their passion, time and attention to evaluating, educating and guiding qualified student-athletes and families through the college planning and recruiting process.